A It's neither Celtic nor Rangers. The team in question is Parkhead FC, who had no relationship with either of the big two clubs and whose ground was Helenslea Park. The trophies referred to in the letterhead are the Scottish Junior Cup, Glasgow Junior Cup and Glasgow Junior League. Confusingly for those unfamiliar with the set-up, Junior football in Scotland doesn't refer to age but is a different grade of the game, roughly equivalent to non-league in England. 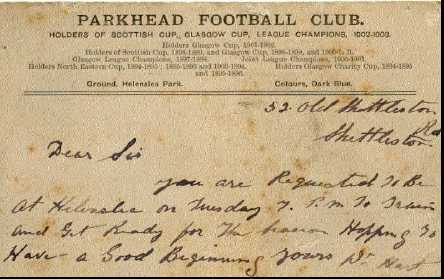 Parkhead were a highly successful club in their day, winning the game's top prize - the Scottish Junior Cup - five times and playing in nine Finals. They are no longer in existence. A Alex Ferguson scored 35 goals for Rangers - 25 in the League, four in the League Cup and six in the Fairs Cup. He was top Rangers scorer overall in 1967-68 with 24 goals and also their top scorer in the League the same season with 19. A Thanks for the kind words re the site. Yes, Clydebank are playing (and doing well) in the Juniors. But technically and legally they are a different club from the one that played in the Scottish League even though it's by and large the same supporters that follow them. This is because the senior team never actually lost their place in the League but were taken over and moved to Airdrie. Somewhat ridiculously this is reflected in publications like the otherwise superb Scottish Football League Review which sees Airdrie United as merely an extension of Clydebank and lists old Bankies records for the 'new' club. The team that joined the Central League in 2003-04 was, as I'm sure you're well aware, brought into existence thanks to the dedicated efforts of Clydebank supporters. Q Some queries on the game's early days from Pedro Ramalhete. 'I've a little question about Vale of Leven. They were a very successful club in the past but what happened to them? There is a junior club with the same name. Do they have any relation or is it a completely different club? A The answer to your first question is yes AND no. The old senior Vale of Leven went out of business in the late 1920s and the present junior team wasn't formed until 1939 but they play at the same ground (Millburn Park) as the seniors did. This is quite common in Scottish football. A lot of junior teams were once senior clubs or formed after the senior team went bust. Sometimes, like Vale of Leven, there are a few years between the two events while others went straight from senior to junior. Queen's Park (founded 1867) are the oldest, Kilmarnock (1869) second oldest and Stranraer (1870) third oldest. Hooper scored the only goal. The FL team, as you can see, was a pretty cosmopolitan lot with the likes of Welshmen Jack Kelsey and Cliff Jones plus Scot Dave Mackay lining up alongside English stars like Bobby Robson and Jimmy Greaves. A This was the squad for Italy in 1990. Roy Aitken was captain. Jim Leighton, Andy Goram, Bryan Gunn, Roy Aitken, Maurice Malpas, Alex McLeish, Dave McPherson, Stewart McKimmie, Gary Gillespie, Richard Gough, Craig Levein, Stuart McCall, Paul McStay, Murdo McLeod, Jim Bett, John Collins, Gary McAllister, Maurice Johnston, Robert Fleck, Ally McCoist, Gordon Durie, Alan McInally. The only outfield players who never got a sniff of the action were John Collins and Gary McAllister. Back-up keepers Goram and Gunn were also idle. All the others played at some point of the tournament. Alan Brown sends additional information on the recent query on the James 'Fister' Walls testimonial match. T.Hamilton; Manderson, McCandless; Craig, Cunningham, Meiklejohn; Archibald, Chalmers, Henderson, Cairns, A.L.Morton.